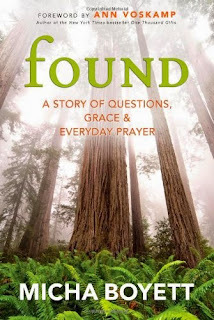 I was drawn to Found, Micha Boyett's memoir/musings on Benedictine spirituality for several reasons. First off, Boyett writes from the perspective of a one-time youth minister turned stay-at-home mom who moves away from all her relatives when her husband's job takes them to San Francisco. The tension of wanting to be a good, content nurturer to her son amid the mundane and often wearisome tasks that rob her of her prayer life was something with which I easily relate. I was also interested in learning more about praying the hours, as I've been exploring various Christian spiritual practices beyond my own culture. 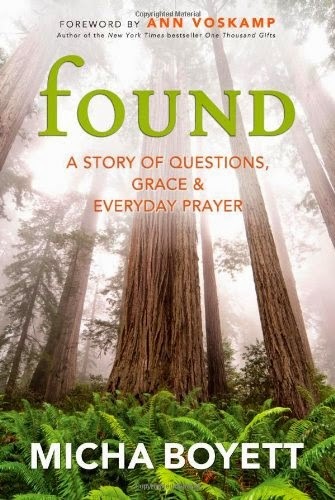 Finally, the foreword is written by Ann Voskamp of One Thousand Gifts fame and the opening pages are graced by recommendations from Rachel Held Evans and Sarah Bessey, who've both written books I enjoyed. I know the blur of caring for baby boys who turn into toddler boys, and the dulling affect motherhood far from close friends and relatives can have on one's psyche. I also agree wholeheartedly with Boyett's eventual epiphany that we need to see the spiritual in the mundane and treat all our tasks as calling. But I couldn't help but shake my head a bit (perhaps in jealousy) of her seemingly charmed life. What was isolating to her, would have been invigorating to me-- living in a destination city, bustling with diversity and culture and young professionals--- being near a beach, never suffering the intense sun or snow of other locales being able to walk everywhere!!!... Boyett finds a way to be mopey about most of these things that really bothered me. At first. But as I was complaining to my husband about the book I started to get that uncomfortable feeling that God was quietly writing in the sand. I'm hopelessly guilty of the grass-is-greener syndrome that I found so appalling in Found. I've adopted the author's habit of praying the Jesus Prayer ("Lord Jesus Christ, have mercy on me, a sinner") and its abbreviated forms throughout the day when I can't seem to put my hearts' longing or confession into words. I would like to adopt her habit of singing simple hymns like "I have decided to follow Jesus" and "All to Jesus I Surrender" over her son in the crib. Like Micha, these are ingrained in me, and I also hope to pass them on to my boys. In particular, I loved the Micha's thoughts on charismatic experiences after attending a small group in her Texas hometown, where her brother is a pastor. His church, she writes, "has become my charismatic home away from the liturgical" (97). She says that when people give her words of knowledge she's scared that they're right and she's also scared they're lying because she's seen both happen. Yet she has an experience where God does speak through a few people at the gathering and experiences a real healing from her performance mentality. I'm interested in finding a spiritual director or perhaps taking a retreat sometime in the future. And I'm more motivated to pick back up with Lectio Divina-- or sacred reading that combines small portions of scripture with meditation and prayer. Overall, when I kept my envy in check, Found was an easy read and I related to many of the author's sentiments. As mentioned above, I did find some gems in this book; however, I found it hard to really grasp Benedictine spirituality despite the chapters following the various "hours" of prayer. This probably isn't for the newbie, even though Micha writes from that perspective.